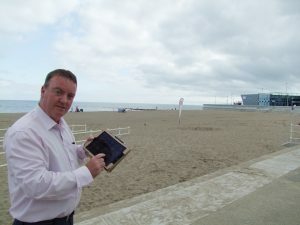 Free Wi-Fi for Colwyn Bay beach | News by Wales Express News, People Before Profit! Free Wi-Fi is being made available on part of Colwyn Bay beach and promenade in a three-year pilot project by Conwy County Borough Council. Cllr Mike Priestley, Cabinet Member for Communications checks the Wifi on Colwyn Bay waterfront. The Council is providing free WiFi for people to access the internet with their mobile devices like laptops and phones on the beach and promenade, from Porth Eirias to the Pier. The free WiFi zone is identified by signs on lampposts. There will be some restrictions in place: types of sites and content that can be accessed; the times of access and, to make sure that as many people as possible are able to make use of the service, there may be limits on the bandwidth speeds for users.